Suppose someone asked you what you really wanted for a birthday present, and your answer was “my own private H-bomb”? Suppose you wanted to impress your primary enemy of 70 years, which happened to be the greatest power on earth, by blowing it off—and the powers-that-be were asleep at the switch? Suppose both happened at the same time? The timing of North Korea’s nuclear explosion this week is easily explained: It happened a few days before Kim Jong Un turned 33, on January 8. Their last nuclear test was four days before his recently deceased father Kim Jong Il’s birthday on February 16, 2013. Since the first test in 2006, all four have occurred at roughly three-year intervals. Adding more weight to this week’s celebration, Kim Il Sung, grandfather to Kim Jong Un and founder of this benighted country and its peculiar brand of “socialism in one family,” arrived back in Pyongyang in 1945 from his anti-Japanese guerrilla adventures and quickly consolidated power—at the age of 33. Thus the regime finds ever-more-obvious ways to coif and exalt the grandson in the image of Kim Il Sung, circa the late 1940s. These birthdays will soon all be holidays (two are already), and if this dynasty persists through a few more generations, birthday holidays will come one after another, to the great relief of its hardworking masses, just as the anniversaries of A-bomb tests are celebrated no end. Suppose, halfway around the world in Washington, no one is paying attention? Now and then shadowy intelligence sources report activity around the North’s test site at Punggye-ri in the country’s far northeast, suggesting an upcoming A-bomb test. Sometimes they get it right, most times they don’t. This time there was not a hint of an imminent big bang—except from Kim Jong Un, who boasted of having an H-bomb last month. Perhaps the intelligence folks were recovering from New Year’s benders. But then Washington never does seem to get the point, even when bludgeoned with big bombs and long-range missiles. Shortly after Barack Obama entered the White House, Pyongyang chose our Memorial Day to blast off its second A-bomb. So far as I could tell, no one noticed the coincidence. Another much-heralded missile test occurred on July 4, 2006. Birthdays and memorial days mean so much to North Koreans; they must have a team scouring the American calendar for holidays that they can punctuate dramatically, not realizing that most Americans are at the beach. If Kim’s birthday was the timing, the strategy is to bump Washington off its stance so that there is nothing to talk about with Pyongyang except how it will dismantle and destroy its nuclear capability. Washington calls this policy “strategic patience.” It is unquestionably patient; nothing productive in regard to North Korea has emanated from the White House in seven years. But it isn’t very strategic in that it opens a clear venue for the North to invest in more bombs and more missiles. Knowledgeable experts say they will probably have 20 nuclear weapons by 2020, with some believing they have already miniaturized nuclear warheads for their missiles. Obama is not the only president to blame, however. Since Bill Clinton’s first term, the default form of “strategic patience” has been to wait until North Korea collapses (with George W. Bush adding the fillip that he would help it collapse, by virtually declaring war: putting it in his “axis of evil” and targeting it for preemptive strikes in the September 2002 “Bush Doctrine”). Even Clinton’s biggest achievement, the 1994 deal that froze the North’s plutonium facility for eight years, was predicated on the regime’s inevitable collapse. American inattention must drive Kim Jong Un nuts. On January 6, CNN covered this story all morning long, until the White House averred that it probably wasn’t a hydrogen bomb, whereupon CNN went back to wall-to-wall coverage of Donald Trump. True, it probably wasn’t an H-bomb. The blast tipped the Richter scale at the same place as the 2013 atomic bomb test, 5.1. Some bona fide experts—unlike the pundits on CNN and Fox passing as North Korea specialists of whom I have never heard of (and I’ve been in this field for 40 years)—like physicist Siegfried S. Hecker of Stanford University, thought this blast was bigger than the 6-10 kiloton 2013 blast, and if it had an H-bomb component, it was probably something (tritium?) added to a fission bomb to give it more heft. In other strategic respects, President Obama has not been inattentive: Back in 2013, after years of skirmishes between the North and South in their West Sea that left dozens dead, and with Defense Secretary Leon Panetta stating that “we have been within an inch of war” with the North for months, he directed B-2 bombers to drop dummy bombs on islands off the South Korean coast, with the Pentagon making clear that they were “nuclear-capable.” With this, Obama mimicked Harry Truman, who during the Korean War mounted Operation Hudson Harbor to send B-29s on nuclear bombing runs over the North, dropping heavy duds to see if atomic bombs might be useful in destroying enemy troop concentrations. The decision was that they weren’t, so we used conventional incendiary bombing techniques perfected in World War II to efface nearly every North Korean city. North Koreans know about this carpet bombing by heart. How many Americans know—or care? The United States sent 25,000 combat troops into southern Korea in the same month that Kim Il Sung landed, September 1945, hoping to keep him and his allies from taking over the whole peninsula. 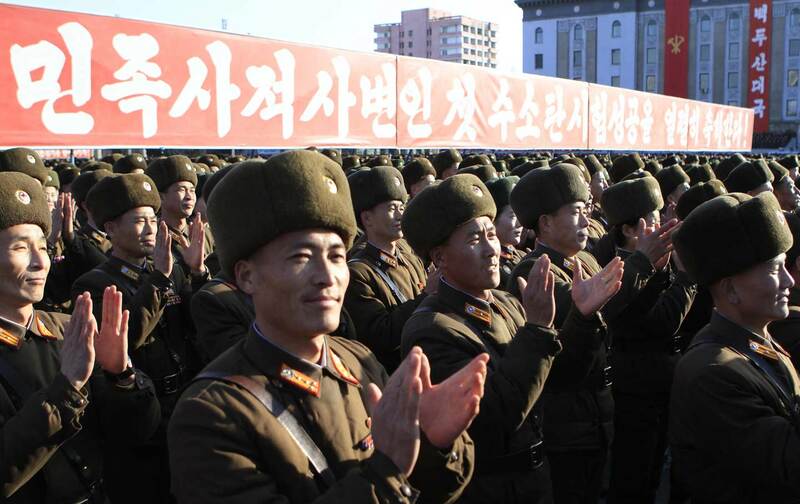 Now it is 2016, we still have 28,000 troops sitting in the South, and no progress has been made to the perennial goal of getting rid of the Kim family and its regime. If that is not strategic failure, what would it look like? The last element of timing in Pyongyang’s ersatz H-bomb blast, I am quite sure, is to get Obama to engage North Korea diplomatically before he leaves office, as he has done with Cuba, Iran, and Burma. North Korea is the last pariah state and, compared to the others, by far the most dangerous if it continues to be left out in the cold. The way to do it, as Dr. Hecker has frequently argued, is to open negotiations to cap the North’s bomb and missile programs, before it has an arsenal that can directly threaten the United States.